The small Atlantic seaboard state of Maryland encompasses three geographical regions. 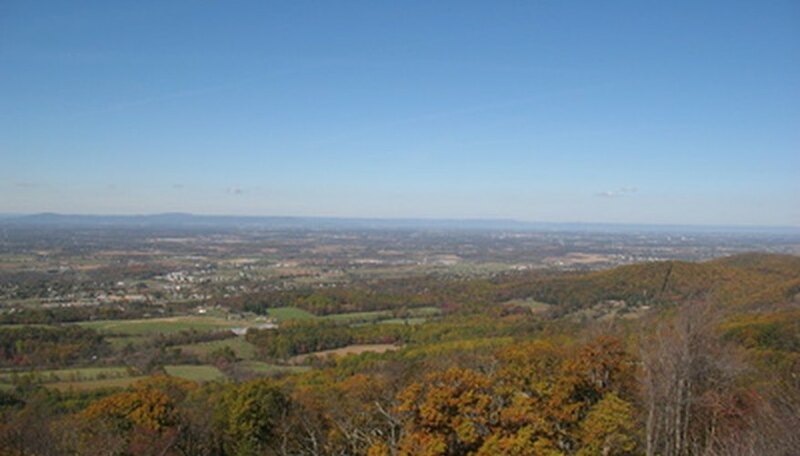 They are the low, marshy coastal plain; the Piedmont's rich valleys and rolling hills; and the northern Blue Ridge Mountains. Many Old Line State native plants--those growing there when the first Europeans arrived--will thrive in all three regions. Ranging from ground covers to trees, they provide low-maintenance garden beauty and wildlife food and shelter, says the University of Maryland Extension. Wild ginger (Asarum canadense) is a perennial 4 to 8-inch ground cover native to the Maryland woods. Each plant has a pair of green, heart-shaped leaves that often conceal its reddish brown flower. Flowers appear between April and June, according to the Lady Bird Johnson Wildflower Center (LBJWC). Ginger-flavored roots spread quickly into large colonies. Wild ginger likes partial to full shade and moist, humus-rich, acidic soil. Handle with gloves to avoid skin irritation. Virgin's bower (Clematis virginiana), a rapidly growing perennial vine, has dark green leaves and fragrant mid-summer to early fall flowers. Its nectar attracts hummingbirds and butterflies. Female flowers produce feathery seeds, states the LBJWC. Virgin's bower grows up to 20 feet a year and needs the support of a trellis or fence to prevent it from climbing over other plants. Give it full sun to part shade, and moist, organically rich soil. All the parts of this plant are toxic. Handle only with gloves and do not ingest. Marsh marigold (Caltha palustris), a succulent in the buttercup family, grows along Maryland's streams, in wet woods and marshy areas. Its hollow, branching stem has glossy, green heart-shaped leaves. Growing up to 2 feet high, it has brilliant yellow, buttercup-like blooms in April and May. Ingesting large amounts of its leaves is toxic, according to the LBJWC. Its juice may blister or inflame the skin and mucous membranes. Plant marsh marigold in partial to full shade and wet, acidic rich soil. A 10- to 15-foot shrub, witch hazel (Hamamelis virginiana) has multiple trunks and crooked branches. Its green leaves become yellow in the fall, dropping before the branches bear their fragrant, wrinkled yellow flowers. Shrubs bloom from September to December, when flowers give way to brown oval seedpods that can expel their seeds up to 30 feet, states the LBJWC. Plant in full sun (for best flowering) to shade and acidic, rich well-drained soil. Keep witch hazel plants well watered. Chokecherry (Prunus virginiana) is a small--up to 30 foot--tree native to Maryland's moist woodlands, stream banks and roadsides, according to the LBJWC. From May to July, it bears fragrant clouds of 3- to 6-inch white flower clusters. The black or red cherries that follow become increasingly sweet as they ripen through August and September. Use them in syrup, juice, jelly and vinegar, but avoid the toxic twigs and leaves. Plant chokecherry in sun to shade and pH-neutral, moist soil.